We're currently using Ripple for modeling our objects in Riak. Since we are test first, we needed some matchers to help make specifying our Ripple::Documents easier. These matchers were created by extracting specifications from within Ripple's test suite. 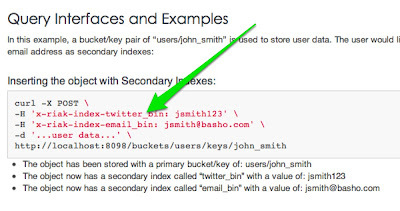 Riak recently introduced Secondary Indexes (a.k.a. 2i). 2i allows objects in Riak to be stored with additional queryable values. At Validas we have leveraged 2i for validating uniqueness instead of relying on MapReduce or RiakSearch to perform the check, among other things. This worked great for us in our local dev environment. Unfortunately when we deployed to our staging environment any feature that leveraged 2i failed to work. We spent a good amount of time reviewing our specs and feature implementation, but everything checked out fine so we moved on to our Riak app.config, comparing line for line the staging and development configuration. This did not produce any answers either. Eventually we landed at our load balancer, Nginx. When we bypassed Nginx 2i worked perfectly! We could add an index to an object and then find the object by searching for the indexed value. We were able to determine that Nginx was removing the index header information from our request. Not sure why Nginx was squashing a seemingly innocent 2i header and not other Riak specific headers, we ran across this post ... How to get non standard http headers on Nginx. Nginx by default removes header that use underscores. 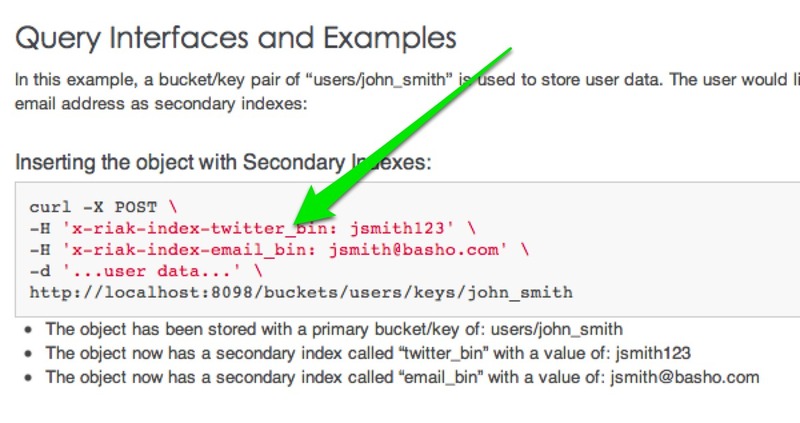 As you can see here, Riak depends on underscores for managing secondary indexes as it suffixes the index name with '_bin'. That same post generously linked to Nginx: underscores in headers which shows you how to modify your Nginx config and allow underscores in headers. Once we made that change, all of our Riak 2i features worked flawlessly! Hopefully if you have this problem you find this blog post in less time than it took us to troubleshoot! %% To enable Search functionality set this 'true'. Don't forget to restart Riak afterwards. From the Rails console you can enable the commit hook for the model you would like to make searchable. Keep in mind anything created prior to doing this will not be searchable. You will need to go back afterwards and essentially touch each of those objects. Just replace MyObject with class you wish to make searchable. Since XCode no longer packages gcc, you need to do some fancy dancing to get your rubies compiled. I already knew that specs should not describe implementation and I prided myself in being able to abstract the implementation details away from my specs. But as Jim elaborated further on specifying behavior and what was sufficient, I realized that I could not entirely rewrite my apps from just the specs. Why? Because even though I had abstracted away implementation details, my specs still contained some implementation details. Take this snippet for example. What’s wrong with it? Most Ruby developers would say nothing. And I used to too. Now look again at the very beginning. What is it that is being specified? The class name. The class name is being directly stated in our specification identifying how we are implementing our behavior. This is typically an accepted approach when using RSpec, but if our goal is to achieve the writing of specifications and remove implementation details from our code, then this is not ok.
“Ok then, how should it look?”, you ask. Let’s take a step back. In our example we are trying to describe converting roman numerals to integers, so let’s write that. Awesome (I <3 Ruby)! That is something we can work with. And the magic sauce that brings it all together ... custom matchers! Custom matchers easily allow us to be more expressive in how we write our specifications and provide nice wrappers for our implementation details. Here is an example of what a custom matcher would look like based on how we just wrote our test. I don’t know about you, but those specifications are much easier to read AND to maintain. And yes, this does translate to your project. We've been taking this approach since January and have seen big gains in reducing any brittleness in our tests, but also we’ve seen the quality of our code increase significantly! I hope this helps you in your quest to write better specifications. Special thanks to Jonathan Knapp for pairing with me that day as we explored this approach together in our quest to best roman numerals! I am often asked how we deliver software here at Dix Communications, to which I reply, “Our way”. Over the years I have been exposed to a variety of methodologies for developing and releasing software; the list includes RUP, eXtremeProgramming, Lean, Scrum, and even some Waterfall. The one aspect of all of those that sticks out above the rest is the opening sentence in Kent Beck’s book ‘Extreme Programming Explained’, “XP is about social change”. Charles is happy! His tests are GREEN! 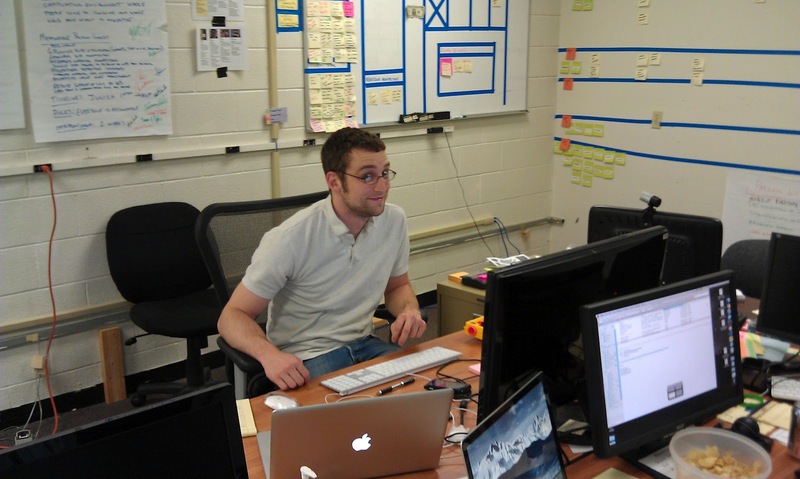 Everything about a software project requires social interaction. So if you are looking to improve your projects chances of success, look for ways to improve the social interaction with your project. Agile, Lean, eXtreme Programming and Scrum all introduce ways to improve social interaction and we have taken a best of bread approach that suits our needs and that is what we use here in the Digital dept. In forthcoming posts I will describe which techniques we have found instrumental to us building and delivering successful software applications. "undefined method `version' for nil:NilClass"
Thanks to Tommy Ryan for posting his solution!